I just got back from a dog trainer’s party! Well, no balloons, cake, or cocktails, but still lots of fun. 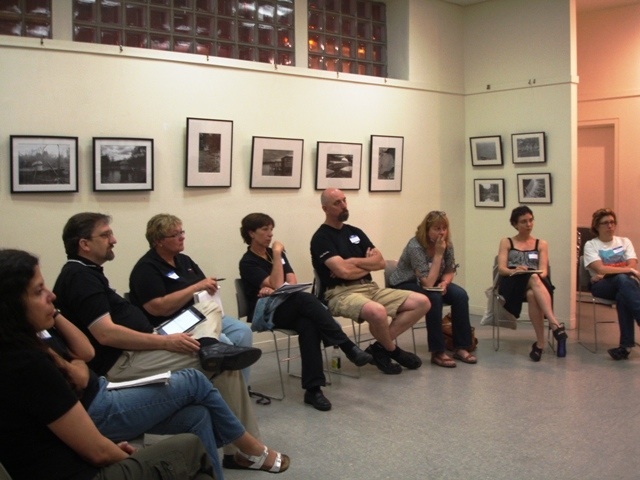 It was a meeting of tri-state dog trainers and sharing of questions, experiences, knowledge, and training methods, hosted in Manhattan by the Dog Trainers’ Connection. 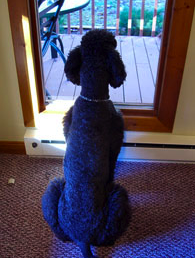 Separation anxiety means your dog barks, whines, or otherwise shows distress when you leave him home alone. It can be triggered by things as simple as putting on your shoes or picking up your housekeys. It can begin as subtly as your dog following you from room to room (a “Velcro dog”). And I’ve seen cases so intense as to cause the dogs to chew, dig, and destroy apartments, physically injure themselves by breaking nails and teeth, and get their owners evicted. I found it interesting to learn that one of the main contributing causes of separation anxiety is a dog’s lack of “confidence”. Confidence being alone, of course; but also general confidence being in the world, feeling like a valuable, contributing member of your pack. One of the main ways of improving your dog’s confidence is with basic obedience training – teach him commands like “sit”, “lie down”, and “heel”. Dogs crave jobs; unlike most of us, they love working for a living. And a dog that works hard will be that much more content taking a break when you leave. Another related benefit of obedience training is that your dog’s behaviors will become “predictive”. That means that instead of anxiously and desperately throwing out new behaviors like whining, barking, spinning, digging, and running around, in a non-rational effort to try to get what he wants, he’ll learn exactly what to do that does successfully produce the desire results. If he goes to his bed and lies down, you throw him a rawhide; if he sits calmly while you leash him up, he gets to go for a walk; and so on. He learns which behaviors predict which results, and can let go of his anxiety. Predictive behaviors mean more confidence, which means a calmer happier dog when left alone. Gradually increase separation time over days and weeks.